Been sat looking at the screen for quite some time, not knowing how to start this post, and then sat even longer not knowing how to break such devastating news to our Party Squad families and friends in total disbelief that I have to write this. DJ BooBoo has been such a massive part of The Party Squad, our world will never,ever be the same again. It is with unbearable sadness that we have to break the news that Kev, our wonderful friend DJ BooBoo sadly passed away last night, after sudden heart problems. All the kids loved DJ Booboo! Kev had a heart of gold, and would do anything for anybody, and always had time for The Party Squad families. Our hearts are broken, Kev wasn’t just a colleague, he was like my little brother and I was his annoying hyper big sister , his family were and always will be my family. We used to have a joke at every party and say we would retire at the end of each party, well my lovely you have retired with Wings to Heaven now, you are now with our Forever Stars DJ BooBoo, go give them a party they will never forget in Heaven! BRAND NEW! 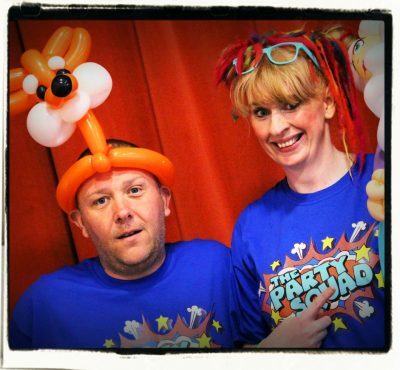 The Big Bang Theory Science Workshops, Demos & Parties! The Day Ditzy Met the Queen…kind of! What’s a professional face painter’s worth to your event?